Gongshisaeng refers to those preparing for public service examinations. It is a compound word made up of the Korean words for public servants, tests and students -- gongmuwon, siheom and haksaeng, respectively. Noryangjin, located close to Yeouido and the Han River, is an area best known to inbound tourists for its seafood market. 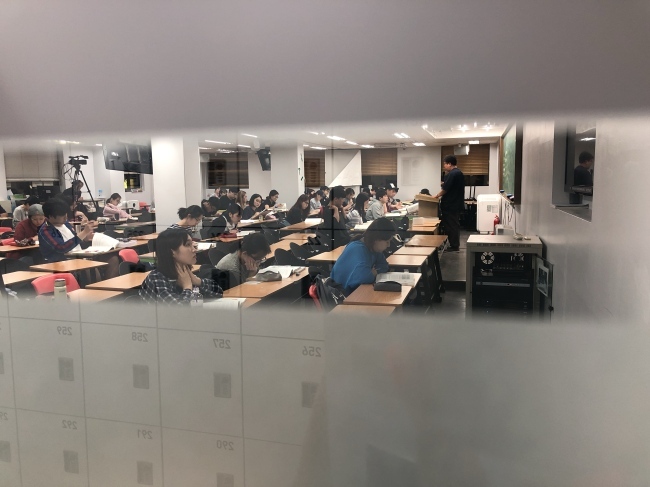 But it is also a place where studious job seekers gather in hopes of passing national exams for public servant roles, so much so that it is often called “gongshichon,” meaning public servant exam-oriented village. 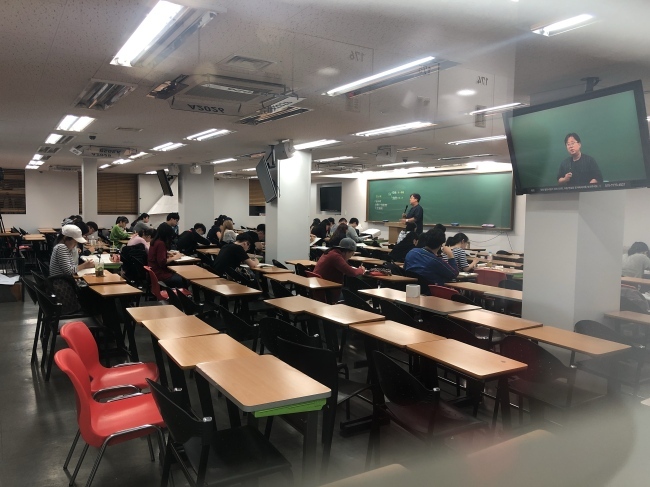 On a Sunday night, at around 11 p.m., a cram school in the district was still filled with students attending a makeup lecture for Korean history, a prerequisite course for all public service exams. The next morning, from 5 a.m., a line forms in front of the same institute, with class takers wishing to secure front-row seats for lectures. 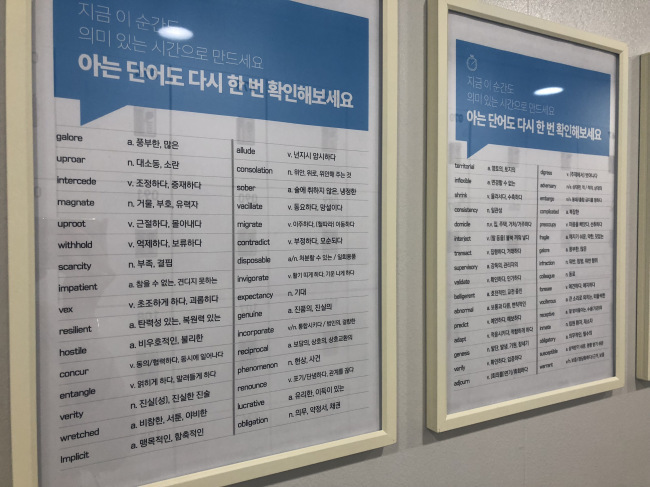 The list of positions that students are vying for appears endless, from those who will work at the National Assembly and at public schools to immigration control, city janitors, firefighters and nursery teachers. 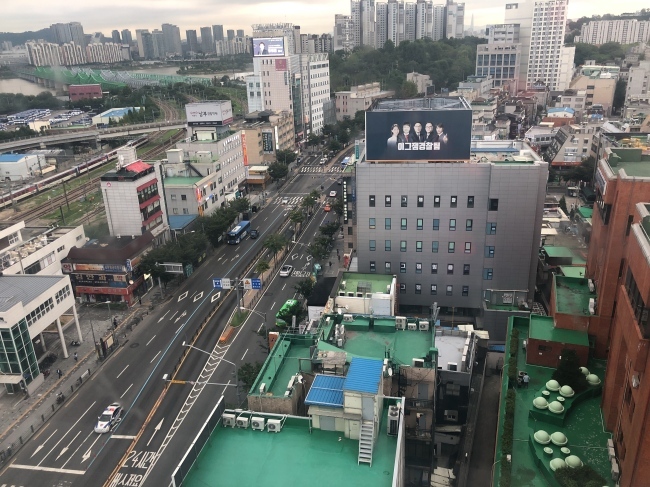 “Noryangjin is like a dreary island within Seoul,” recalled Kong Hye-won, a 27-year-old who had come to Seoul from Gwangju to study for the grade-nine civil servant exam. After spending two exhausting years on the grind, Kong decided to return to her hometown to seek a different line of work. “The life of a gongshisaeng isn’t the life of a human,” Kong said. Life in Noryangjin certainly appears to be different from the rest of Seoul. On both sides of the arterial boulevard in Noryangjin and its sprawling alleyways, cram institutes tout comprehensive and intense study environments that will raise one’s chances at passing the tests. Abstinence from everything that distracts is a must. “Frustration, anxiety, weariness ... discard everything that stands in your way of studying, along with your waste,” reads a message above a waste bin inside a cram institute. Promotional content for a beginners’ class for English -- another compulsory subject in public service exams, alongside Korean history and Korean language -- says students will be tested on 1,000 words a month. On the walls of a corridor leading to a washroom, English words are printed out on charts. Vociferous, infraction and prodigal are some of the words passersby take in before relieving themselves. A “shadow homeroom teacher” system promises an instructor will call students daily to remind them to come to class and to provide consultation on which subjects to take other than the main compulsory ones. Shin Yeong-sik, 43, has taught Korean history for public servant exams for the past 17 years. His students are usually those trying for grade nine (the lowest) and grade seven public official positions, as well as police officer roles. “These are students who prepare for the exams thinking their life rests on it,” Shin said. “Korea has a chronic problem of limited opportunities for youths. But for the public servant exams, these kids are taking it into their own hands to pioneer their future,” said Shin, adding that he feels responsible to help these passionate and desperate youths. Each of his classes goes on for four hours nonstop, but that does not tire Shin, as he knows his students have it worse, having to attend more classes in the day. Shin’s classroom has a capacity for around 400 students. For the back rows, screens are installed to livestream the lecture and display the blackboard up close. According to Shin, due to the sheer volume of materials to cover, a student must spend at least nine months to a year preparing for all the tests required to apply for public servant positions. 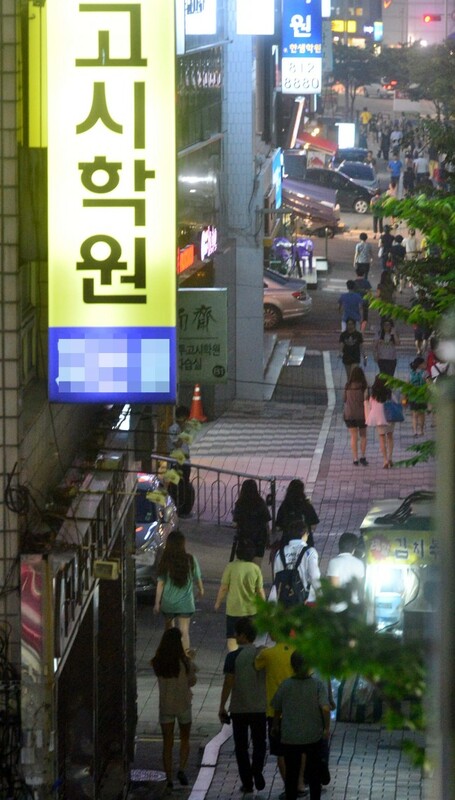 A 33-year-old man leaving Shin’s class at 11 p.m. on a Sunday told The Korea Herald that he could only answer questions in the time that it took for the pedestrian light to turn green. He needed to return home as soon as possible and catch some sleep before starting again tomorrow. Studying to become a firefighter, he says that he came from Gangwon Province to study in Noryangjin five months ago. The hardest thing for him is the loneliness staying away from his family and friends. He declined to be named. A 28-year-old, who quit her regular job to try for the public servant tests, says she spends an average of 14 hours a day studying. She declined to be named. She has it easier than others, she says, because she is aiming for a technical post. Originally from Gyeonggi Province, this gongshisaeng has been staying with relatives in Seoul since May for the period of her studies. “It’s all about perseverance. Rather than study a lot, it’s more about how long you can keep studying. You have to memorize the same things over and over and sit down at a desk for a long time. You can’t meet your friends to hang out,” she added. Some students may grow close to those taking the same classes, but ultimately the exam is a battle one must fight alone. When they need to take a breather, gongshisaeng opt for low-cost and time-efficient activities, such as 24-hour internet cafes or coin karaoke joints. Fortunetellers also offer the would-be public servants some hope, while eateries provide them with the energy to go on.